Don’t cut up your panel and spend extra labor dollars when you can slide-out your old GNS and slide in the IFD. Add the IFD100 iPad app for free and you get another instance of your IFD on big glass plus remote control of the IFD. 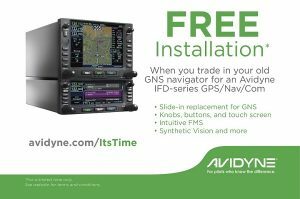 When you buy an Avidyne IFD you get a fully integrated GPS/NAV/COM. You don’t have to buy any additional add-ons. With Avidyne’s exclusive synthetic vision on all our IFDs, you get better situational awareness for improved safety.